단일세포 (Single cell) 분석은 세포의 군집 (cell population)이 아닌 세포 하나 하나를 연구하는 방법으로써, 세포 각각의 고유한 생물학적 특성을 규명할 수 있다. 이는 줄기세포, 순환종양세포 (Circulating Tumor Cells; CTC), 조직생검 (tissue biopsy)과 같은 양이 아주 적고 귀중한 샘플을 분석하는 데 매우 중요하다. Single cell을 보다 민감하고 재현성 높게 분석하기 위한 ‘SMART’한 ‘SMARTer 제품 시리즈’를 소개한다. Single cell은 유전체학 (Genomics), 전사체학 (Transcriptomics), 단백질체학 (Proteomics)과 같이 다양한 학문에서 분석 · 적용될 수 있다. 특히, DNA 수준을 연구하는 유전체학과 RNA 수준을 연구하는 전사체학은 최신의 서열분석기법인 NGS (Next Generation Sequencing) 방법을 주로 이용하고 있으며, 이는 ‘Single cell-seq’으로 통용된다. Single cell 유전체를 분석하기 위한 실험은 일반적으로 ‘Single cell 분리 -> 유전물질의 증폭 -> NGS Library Preparation -> Sequencing’ 순서로 진행된다. 세포 하나에서 NGS 분석에 충분한 양을 얻기 위한 Amplification 과정은 RNA일 경우 Whole Transcriptome Amplification (WTA), DNA일 경우 Whole Genome Amplification (WGA)이라는 특수한 증폭 기술을 사용한다. 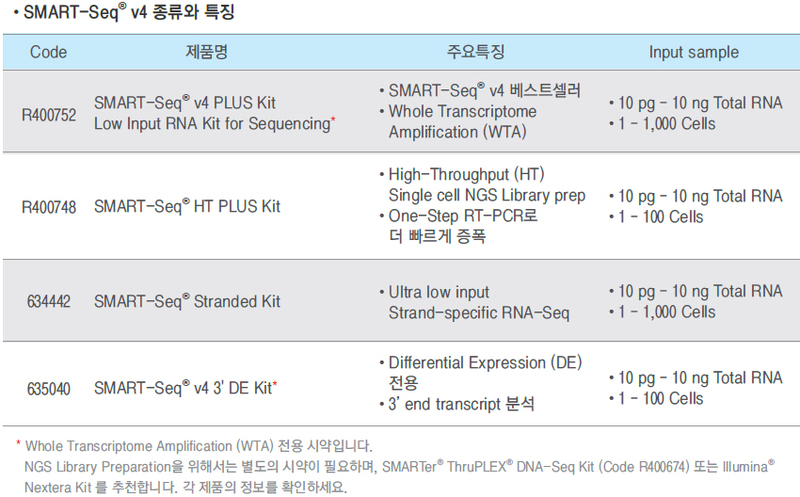 다카라코리아는 Single cell 분리부터 DNA · RNA Amplification, NGS Library Preparation (for Illumina® platform)까지 가능한 제품을 제공하고 있다. That’s Good Science! * 제품명을 클릭하시면 보다 상세한 제품정보를 확인할 수 있습니다. Single cell (단일세포) 분리에서 ‘살아있는 Single cell’ 판정까지 단 30분 소요!